Happy 101st Birthday, Great-Grandpa Riley!!! Today may be April Fool’s, but this is no joke. 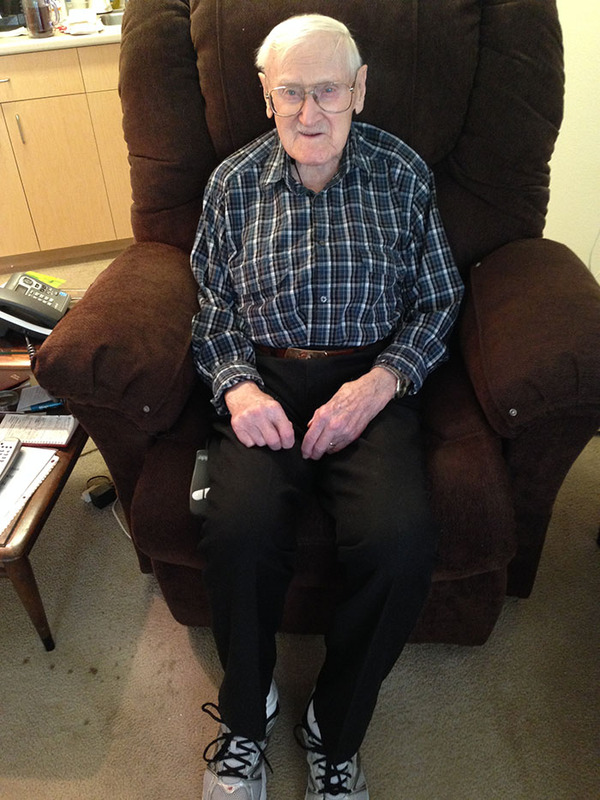 My amazing Great-grandpa, Riley, is 101 years old today!!! He’s definitely one of the most incredible people that I’ve ever known, and I’m proud to call him grandpa. He’s smart, strong, kind, warm, and loving. I truly admire him and hope to be as great as he is one day. His smile, laugh and love are genuine and you feel it as soon as you see him. Happy 101st Birthday, Grandpa!!! Robert Riley moved from Thornton, CO to Paducah, KY in 2009 to be closer to his son and daughter-in-law. He’s been living in an independent living facility which provides a private apartment, meals, housekeeping, and activities. 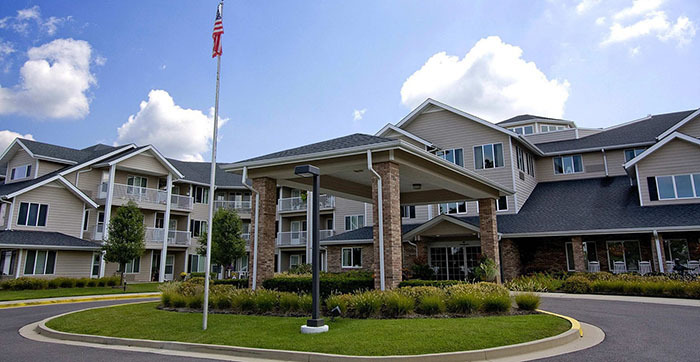 Fortunately, [my aunt Jan + uncle Bob] were able to hire people to help with his personal needs and washing clothes to avoid the nursing home thus far. My aunt and uncle also have a good home health provider to provide physical & occupational therapy, and professional nursing, as needed. My aunt Janice keeps him supplied with snacks, juice, Gatorade, and does his other personal shopping for him, so he’s surrounded by love and care. I also hear that he’s quite popular! In March of 1942, my great-grandfather, Robert Wesley Riley, joined the Air Corps. Robert was supposed to go to Aircraft Engine School, but at the time, there were no openings. He had to wait five months to get into the school. During those five months, he had to take five exams, one every month. After the five months were up, the aircraft engine school let him in without a history of any college. This aircraft school was called Hendricks Field. It was in Sebring, Florida. Everyone in the school was either a mechanic or an engineer. My grandfather stayed at this school for three years. He became a flight engineer. What he did was test the planes to see if they were in flying conditions. For five to ten hours a day, he would test take-offs and landings. After his training at Hendricks Field, he went to Chanute Field in Illinois for one month. He worked on gyro instruments. Gyro instruments are engines that spin. Some examples of gyro instruments are automatic pilots and field indicators. After that, Robert went over seas for twelve months as a replacement. Later my grandfather was stationed in India to work on humidity and temperature control in a factory. He inspected the work of twenty-eight Indian workers who worked on assembly lines. He had to have two interpreters because the twenty-eight men didn’t speak English. He stayed there for one year after the Indian war was ended. 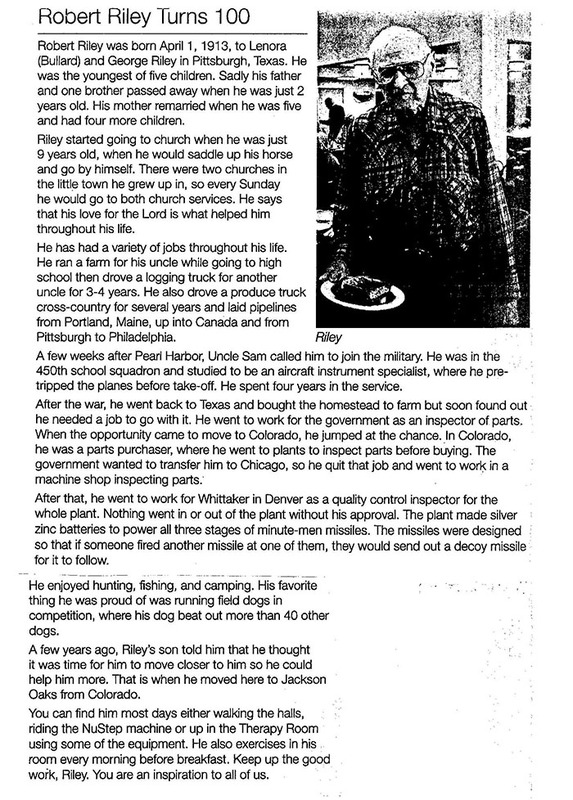 Robert W. Riley had many odd jobs before and after the war. He worked for Arkansas and Louisiana Gas Company right out of high school. He was making nine cents an hour and got a ten-cent per hour promotion for digging ditches. Then he got into trucking companies. He drove trucks for a box factory in Pittsburg, Texas. They would cut down gum trees on the river bottoms and make would make boxes out of these trees. Then he moved on to hauling produce around. He would haul yams out of Texas to Denver, potatoes from Denver to Texas, then he would go down to South Texas to get watermelons and grapefruits to haul them to Denver. The watermelons made good sales. Before my grandfather went into the service, he laid pipeline. It was construction work, but my grandpa hauled and strung oil pipe all over. His boss knew that he was strong, so he took him off of driving trucks and moved him to working the sledgehammer. The unfortunate side of him being strong was that he had to break concrete in order to put in the pipes for ten hours a day with only a sledgehammer. When my grandfather got older, he would go fishing every weekend, rain or shine, with his wife, Helen Riley. He would fish all over Colorado and many other places like Canada. When he went to Canada, he flew in at six in the morning and caught one hundred and forty pounds of fish. It didn’t get dark until midnight. The lake was called Otto Lake and the Indians helped them cook the fish that they caught. They would fillet the fish and quick dry them so he was able to take the fish home. He makes his own flies for fishing and uses different types of feathers. My grandfather also loves to hunt. He’s been hunting since 1952 and has been ever since. In the fifty-six years that he has been hunting, he has only missed one season. He has shot thirty-two elk, many birds, and a few moose. The year he left home on his own was 1929. He left with what clothes he had on his back and the change in his pocket. ($1.25) Luckily for him, he worked in Texas and could get about any job, which was a plus except for the fact that he worked ten hours a day and only made one dollar. My grandfather was one of the lucky ones to get a job and live through the depression. My grandfather, Robert Wesley Riley, was born on April 1st, 1913. He was raised on a farm and took up farming until he graduated high school. On the farm they raised their own mules and used them to plow. He had eight brothers and sisters to help him with the farm work. He started school when he was seven years old. He walked to school everyday, which was 6 miles to and from school. He went to a consolidated school and only wore shoes when at school. He didn’t have much homework, but if you didn’t pay attention in class, the teacher would not re-teach the lesson. When he was ten years old, he was driving his model T around on the dirt roads. My grandfather raised and showed Brittany Spaniels. He had two dogs of his own; their names were Mutt and Jeff. Their registered names for shows were Denver Skyline Rocket and Prince Jeffery of Rocket. They were registered with an AKC book. On November 7th, 1966, Jeff won a certificate for best in show. The dogs would also go out-of-state with my grandpa and help him in hunting birds. He trained Jeff and Mutt by taking pheasant wings and putting them on fishing rods and reeling them in and casting them, making the dogs chase the wings. He also had many training tactics. These dogs were also trained by whistle and were hunting at five months of age. They would stalk and also retrieve the birds. And this isn’t even half of what my grandpa has seen and accomplished! He’s living proof that living a good and healthy lifestyle goes a long way. I’m proud and blessed to have him as my grandpa! I love you so much grandpa Riley – we all do. Thank you for being true to yourself and for being such an amazing role model to us all. I wish we were there with you today. We all miss you very much and want you to know that we think about you. You’re an amazing man and we hope you have a wonderful 101st Birthday! We love you tremendously!!! I want to thank my Uncle Bob for providing me with the latest photo and details on my Grandpa. I also want to thank my brother, Michael, for letting me share his piece on my grandpa’s life. And Thank you to Jackson Oaks for writing such a beautiful piece on him. So much love! This is a great article, RobbieLee.Thank you so much for putting it together and posting. He had a good day and Jackson Oaks had a party for him where he received lots of cards and several gifts-stuffed animals and a little vase with a rose in it.Bob and I took him to eat at Logan’s Roadhouse and for once his food was cooked the way that he likes it. We will make sure that he gets a copy of this. Love you all! Thank you aunt Jan! That’s so special. I really wish we could have been there with all of you. It sounds like he had a great birthday, surrounded by so much love. I’m so glad you all got a chance to read this, and thank you for sharing it with him. He’s so wonderful! I’m glad the restaurant got his meal right! That’s huge, haha. We sure miss and love you all and we hope to visit soon! Thanks for stopping by!